With the ability to use SC Simplex and LC Duplex adaptor types offering a flexible solution to the end user, enabling them to incorporate a multi functional enclosure which allows easy access during installation or re-work with no disturbance of the existing cable or fibres. Each enclosure has integrated strength member tie positions and bend radius protection with the addition of a removable front cover allowing for quick and easy installation. • The oval port is for 1 loop cable or 2 cables with max Ø 20 mm. FTBX-SMC-P-54-NN Fibre Termination Box with SMC material on Pole cable 54 Drop cable Adaptor Unload. FTBX-SMC-P-54-S1 Fibre Termination Box with SMC material on Pole cable 54 Drop cable SC/APC. FTBX-ABS-P-54-S1 Fibre Termination Box with ABS material on Pole cable 54 Drop cable SC/APC. 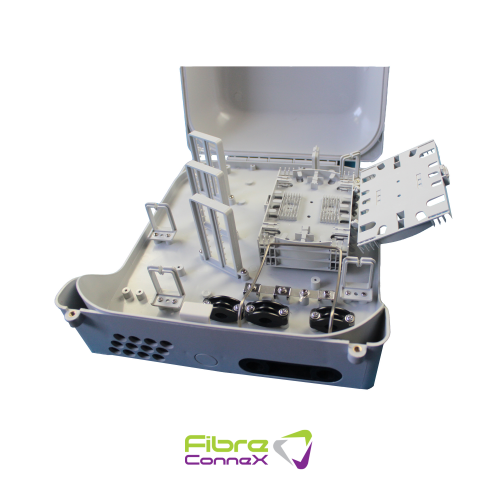 FTBX-ABS-P-54-S2 Fibre Termination Box with ABS material on Pole cable 54 Drop cable SC/UPC. FTBX-SMC-W-54-NN Fibre Termination Box with SMC material on Wall cable 54 Drop cable Adaptor Unload. FTBX-SMC-W-54-S1 Fibre Termination Box with SMC material on Wall cable 54 Drop cable SC/APC. FTBX-SMC-W-54-S2 Fibre Termination Box with SMC material on Wall cable 54 Drop cable SC/UPC. FTBX-ABS-W-54-S1 Fibre Termination Box with ABS material on Wall cable 54 Drop cable SC/APC. FTBX-ABS-W-54-S2 Fibre Termination Box with ABS material on Wall cable 54 Drop cable SC/UPC.